It was a warm enough spring day that my parents let me ride my bike to and from elementary school. I was probably in the fourth or fifth grade. Having crossed the busy street at the crossing guard with my rust-colored nylon backpack strapped on, I mounted my trusty steed… an electric blue metallic Schwinn with a banana seat and long handlebars. It was no BMX bike, but it I loved it. Once we turned off “the shell path,” we were not far from our neighborhood. We all lived within about 2 blocks of each other. Bryan, Wally, and Wally’s younger brother were guys I played with almost every day till we moved. And we competed a lot. So it wasn’t a surprise that when we got our bikes on pavement, we decided to see who could out-ride each other. The race was on! I took off. And while my start on the much heavier bike was not as quick, once I got rolling, I had a full head of steam, and the heavier bike was smooth. I soon overtook the guys on the short street, navigated the right-left turn onto the street where Wally and his brother lived, and broadened my lead. In fact, I was so far ahead, I was less than a block down their street, which dead-ended into my house’s front yard, that I took my hands off the handlebars like a football player high-stepping into the end zone when he has outrun the defense by a mile. I remember looking over my shoulder, seeing the guys just making the right-left turn onto the same street, and turning back around to face forward when all of the sudden my bike hit a small rock in the road. The long handlebars snapped to the right in keeping with the front wheel to which they were attached. This caused the bike to stop on a dime, lurch the back end into the air, and hurl me forward with momentous force. I was so caught off-guard that I did not have time to get my hands out in front of me fast enough to keep my chin from hitting the concrete pavement first. Pain ricocheted from my head through my body. Then my hands caught up to my chin, still thinking they could stop me, only to scrape across the rough pavement. I remember letting out a blood-curdling scream, some might say it was like a little girl. I didn’t care. I hurt so badly that I didn’t think I could get up. The way I landed had also knocked the wind out of me, and so I felt like I was suffocating. Apparently, Wally and his brother, who had just pulled in at their house at the beginning of the street, heard my scream and never got off their bikes. They peddled like crazy to where I was to help. They didn’t laugh at me, and tell me that I got what I deserved for showing off. They simply helped me up, one of them helping me stand and walk… the other standing my bike up and walking it beside us slowly. They told me I was bleeding pretty badly, and when I put my scraped hand to my chin, I pulled it back to discover they were quite right. They walked me all the way to my front door, rang the doorbell, and waited for someone to answer. When my Dad answered the door, they explained what had happened and why I was bleeding so profusely. Dad thanked them for helping me, took me inside and cleaned me up. I probably needed stitches, but Dad opted to clean and bandage the wound himself to see if it would heal. I thank God that on that day I had friends who were there to pick me up, dust me off, help me walk, and carry my bike. And I thank God for those friends whom I have had on other tough days in life, when the hurt seemed so overwhelming that I didn’t feel like I could stand on my own. I want to be that kind of person. I want to be a person who can hear the cry of someone else in pain, and rush to help them. I want to be a person who isn’t afraid to get a little “blood or sweat” on me from someone else’s “injury.” I want to be someone who will get another friend to join us and push our injured friend’s bike for them while they are just trying to get home. I want to be the kind of friend who will invite the Father to get involved, and heal a friend’s wounds. I’ve had those kinds of friends in life. So have you, probably. 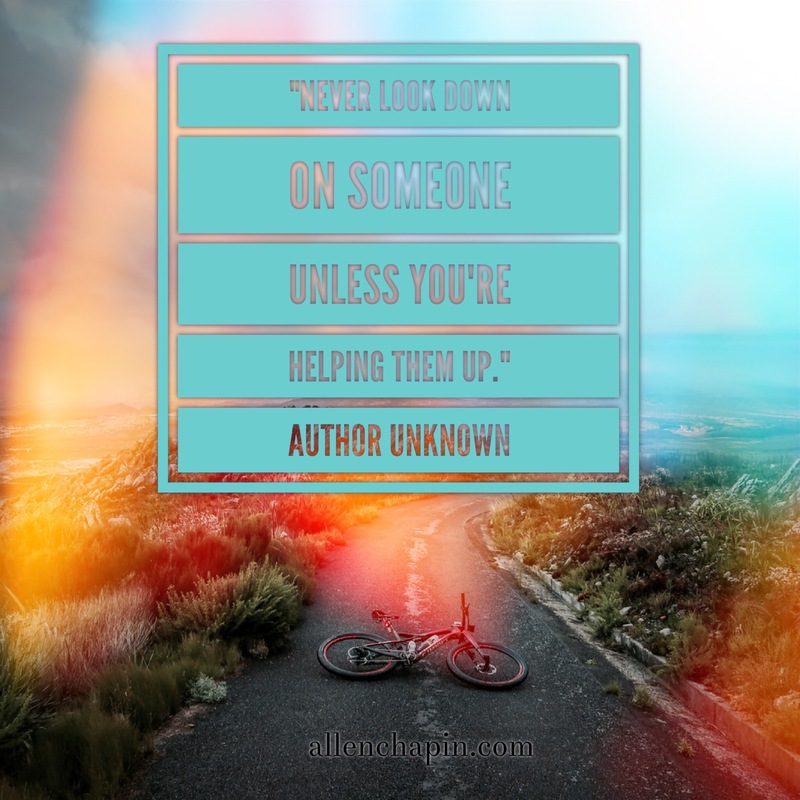 Isn’t it great to know someone is there to help you? Wouldn’t it also be great for someone else to know that you are there for them in a crisis? Today, I want to encourage us to each be the kind of person who rides to the rescue of fallen friends and helps them… and their beloved bike… home to the Father’s loving, healing hands. Prev Post: How Do You Spell That?